We have wanted to join together with our neighbors for some time now. We’re all family in spirit, after all, with a shared vision of working together to promote land conservation. At one of our recent monthly Outreach meetings, WLT volunteers were joined by Jim Bride of the Sippican Lands Trust and Halima Tiffany from the Rochester Land Trust to brainstorm ideas for future programs and we’re happy to announce our first collaboration. Please join us, Sunday, October 22nd, 1:00 p.m. at the Tweedy and Barnes Preserve for a community trail walk. 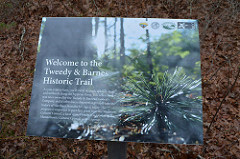 Our Tweedy and Barnes trails were recently improved with historic and environmental trail markers. 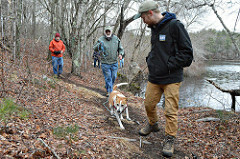 It’s a wonderful place to take a Sunday stroll in the woods and meet and greet with other conservation-minded locals! Reminder: there is no hunting on Sundays in Massachusetts but we always encourage caution. Wear blaze orange. And p.s. 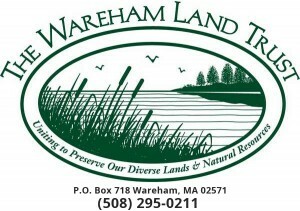 – dogs are allowed at this preserve! The walk is weather-permitting. We will make a determination early morning on the 22nd and update our Facebook page (of course anyone is welcome to walk regardless of the weather!). 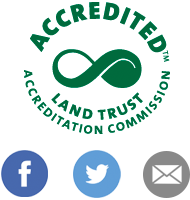 And watch this space for future events co-sponsored by the WLT, Sippican and Rochester Land Trusts.